Real Food Daily: Sushi is Good For You! 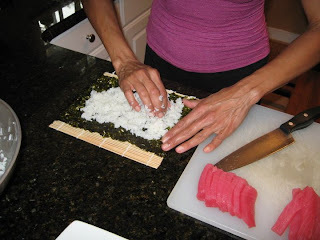 Sushi is at the top of my list of favorite foods...so...I thought it would be fun to learn how to make it. It turns out that there is a lot more work involved that I thought. That being said, I have a much greater appreciation for all the hard work that goes into making sushi taste so yummy! Available in almost every city, sushi is much more than just a tasty meal. In fact, scientists believe it is one of the reasons why the Japanese are among the healthiest people in the world. The Japanese diet of raw fish, vegetables and rice is one of the healthiest in the world and as a result, their rates of heart disease are among the lowest in the world. On average, each person in Japan consumes around 100 grams of fish every day, in forms such as sushi, tempura and sashimi. The omega-3 fatty acids in fish are linked to heart protection and improved circulation. Rice is the staple of the Japanese diet and is a good source of energy and provides a supply of protein. Wasabi is thought to cleanse the palate and has also been found to aid in cancer prevention and prevent blood clots, if eaten regularly. The Japanese have been eating sea vegetables for centuries and they use seaweed in large amounts in their diet because of its concentrated mineral content. Up to a quarter of Japanese food contains seaweed to boost flavor and is rich in iodine, copper, calcium iron and magnesium. Ginger is a popular flavor-enhancer in sushi dishes and is widely known to have therapeutic effects, including aiding digestion. Soy sauce is made from fermented soy beans and is widely used in Japanese cooking. There are some definite benefits linked to a higher consumption of foods rich in soy. For those of you who are gluten-intolerant (like me), the only issue here is the soy sauce. The good news is that San-J makes a wonderful wheat-free soy sauce. San-J is available at Whole Foods Market and most any Health Food store. If you live in Richmond and are interested in learning how to make sushi, please visit the link below.